First and foremost, Harrogate Advanced Bikes aim to make the Advanced Motorcycle training fun. If you’re enjoying yourself, you’ll learn more and quickly! We pride ourselves on the high quality of our training and we are passionate about maintaining and improving this standard. Our goal is not just to bring associates to IAM Test Standard (itself a worthy achievement), but rather to turn out Advanced Riders that meet our own, higher standards. We use the Advanced Test as a measure to ensure we are doing this and aim not just for passes but for “praised passes” from our examiners. 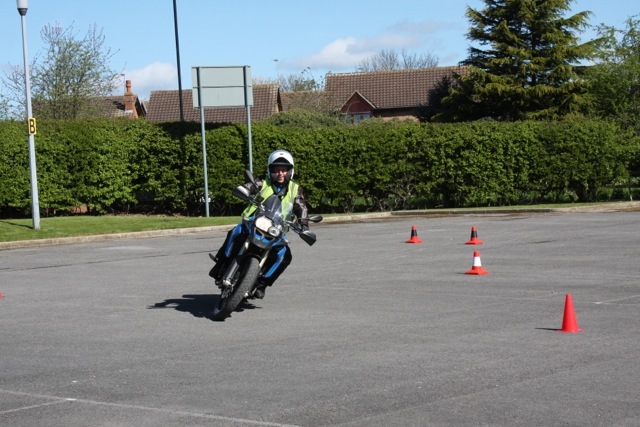 For members who have passed their Advanced Test we hold regular “Rider Skills Workshops” which provide an environment to further improve your riding skills in the company of other like minded individuals (whilst having fun on the bikes, of course). Our regular Rideouts give all members the opportunity to mix continuous practice with enjoyable biking. As far as we at H.A.B are concerned, training starts on your first observed ride and finishes when you hang up your leathers for the last time. As soon as we have your paperwork (see the Joining page), we will put you on the list for training. We usually run two intakes a year of new members for training, one in March and the other in July. The size of each intake depends on how many Observers we have available. The training is performed 1-2-1. You are assigned an instructor, called an Observer, who coaches you to the required standard. Training covers a series of modules – normally over about 9 observed sessions (typically 2 to 3 hours each) during which the observer will cover all aspects of advanced riding. When you start training with us, we do expect commitment as we give our own time on a voluntary basis. We generally ask that associates (trainees) have a session preferably weekly and that they must practice the concepts discussed between in their own time to consolidate what they’ve learnt. The training is provided under the IAM Skills for Life scheme and is mostly based on and around the Highway Code, and Motorcycle Roadcraft – The Police Rider’s Handbook. Details of where to buy these are on our Links page. Our training is conducted by H.A.B Observers who have not only taken and passed the Advanced test themselves, but have consequently improved their own riding to an even higher standard and have been trained as Observers, to effectively pass on that knowledge to others, i.e. you. What’s all this malarkey about Slow Riding and what has it to do with me? Well, basically for anyone who has a bike (including push bikes), we all need to be able to ride slowly to one degree or another. What about while manoeuvring your bike, setting off, filtering in traffic, approaching a give way sign/junction, going to a garage to fill up, undertaking a tight ‘U’ turn, or coming to a stop, to name but a few examples. Think about all the times you have been confronted with these situations, have you always been safe and in control? Or did you think that you were in control! What about all those occasions were you have witnessed bikers using both feet to ‘paddle’ their bikes while manoeuvring or in the ultimate case dropped their bike, oops, expensive! Attending one of our Slow Riding Workshops provides you with a number of techniques and gives you the opportunity to practice the techniques in a safe environment, enabling you to ride your bike slowly, safely, with confidence, skill and as important, while having fun. Once you have honed your skills in slow riding, for those of you that go touring or take a pillion, why not have a go at negotiating the obstacles with a pillion or luggage in place. You may never get the soles of your boots dirty again! How long is each training ride out? Do you stick to the speed limits? YES – we need to observe what the law says. Will my insurance cover the training? Yes and H.A.B also has insurance. £149 for training and test. We also ask for a £10 donation per observed ride for fuel and tyres for the observer to cover costs.